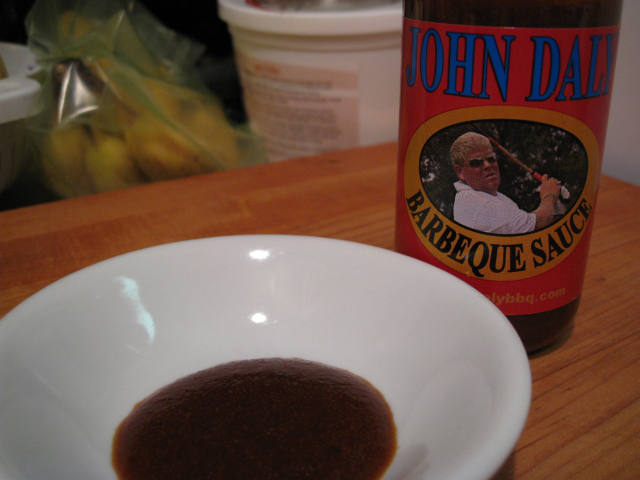 John Daly has officially launched his BBQ products online at JohnDalyBBQ.com. We’ve had the pleasure of trying the Rub and BBQ Sauce firsthand here at HotSauceDaily.com and I have to tell you, they have some great products! Hands down, this is our favorite rub at the moment. We’ve used it time and again on our MOINK Balls, on our chicken, and recently on some ribs. paprika sugar, spices including celery and turmeric, salt, dehydrated onion and garlic, citric acid, ground mustard seed, modified food starch, extractives of spice including paprika, FD&C Yellow #5 color, and not more than 2% sodium aluminosilicate to prevent caking. Ok, there’s a couple of questionable additives in there, but when you buy a pre-made rub versus making your own, you’re going to get that stuff. Fear not, this rub is excellent in both flavor and texture. A little goes a long way. Here’s the flagship product, and it’s a winner. It’s a thin sauce, with a satiny finish. It’s not too sweet with a savory flavor and just a hint of heat. tomato sauce, worcestershire sauce, brown sugar, honey, lemon juice, Tabasco sauce, liquid smoke, black pepper, red pepper flakes, salt and spices. This sauce is going on my list of top 5 sauces to keep on hand. I especially liked it on our barbecued chicken, which I’ll post in detail soon. In addition to the Rub and BBQ Sauce, they also have a nice Salsa that we just opened last night. Stay tuned for a review of that. You can purchase all of the John Daly products here. The BBQ sauce comes in 10 and 20 ounce sizes. Go for the 20 oz., this stuff will go fast. Ditto on the Rub. Also, be sure and check out The Lion’s Pit the official Blog of the John Daly BBQ folks. Randy Combs does a great job on there. Tell ’em HotSauceDaily sent you! You’ll have to post the BBQ Chicken soon. That sounds like something I’d like to try. 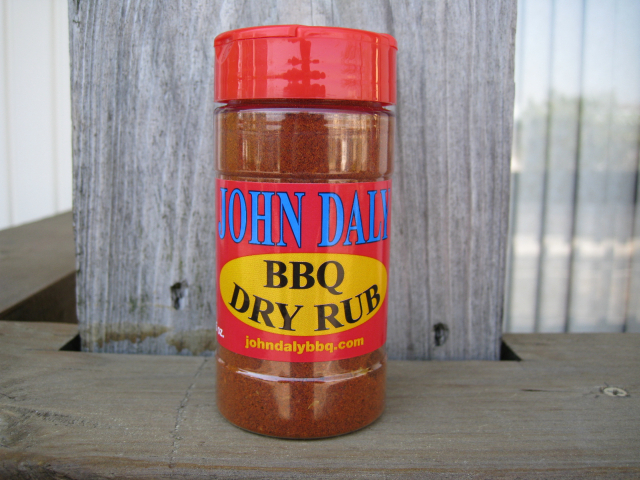 We are LOVIN’ the John Daly’s BBQ Rub, and the BBQ Sauce is soo good. These guys really have a great couple of products on the market. Run, don’t walk, to their website and order some stuff. You will NOT be sorry.